It is called a singular matrix. The following diagrams show how to determine if a 2x2 matrix is singular and if a 3x3 matrix is singular. Scroll down the page for examples and solutions. The given matrix does not have an inverse. It is a singular matrix. When a matrix cannot be inverted and the reasons why it cannot be inverted? How to know if a matrix is invertible? How to know if a matrix is singular? 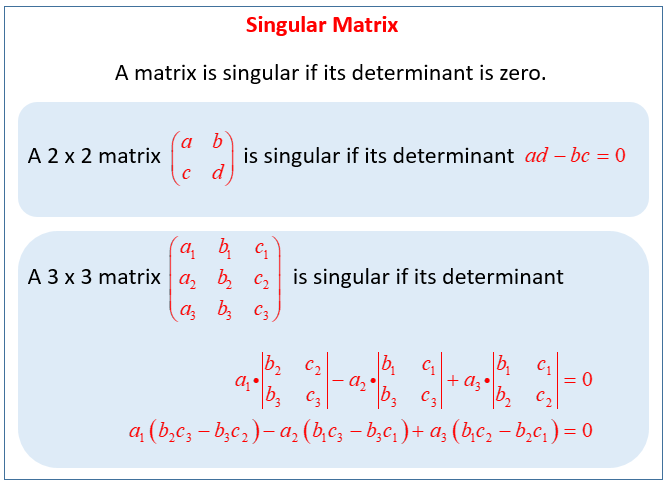 What is a Singular Matrix and how to tell if a 2x2 Matrix is singular? A matrix is singular if and only if its determinant is zero. Are the following matrices singular? A square matrix A is singular if it does not have an inverse matrix. Determine the value of b that makes matrix A singular. 1. Determine whether or not there is a unique solution. 2. For what value of x is A a singular matrix. Determine the value of a that makes matrix A singular.